"Quick, easy cool-weather vegan chili." Heat 5 tablespoons vegetable broth in a large skillet over medium heat. Cook and stir onion, garlic, and jalapeno pepper in the hot broth until slightly tender, about 5 minutes. Add sweet potatoes, chili powder, cumin, paprika, oregano, and red pepper flakes to onion mixture. Pour remaining 2 cups vegetable broth over sweet potato mixture. Bring vegetable broth mixture to a boil, reduce heat to medium, and simmer until sweet potatoes are tender, 20 to 25 minutes. 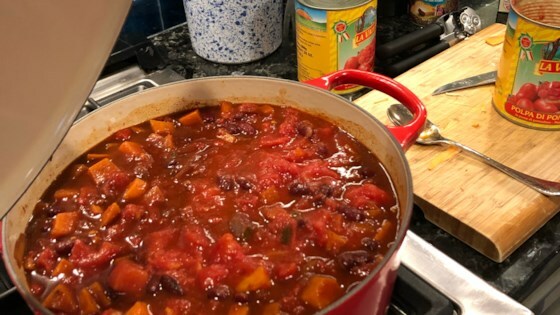 Stir tomatoes and kidney beans into sweet potato mixture and simmer over low heat until flavors have blended, about 45 minutes. This is spicy and sweet! It's a great combination! Thanks for the recipe! This was really good! I didn't have smoked paprika so I used sweet paprika and some chipotle spice blend with a dash of liquid smoke. Skipped the pepper flakes. I would make this again. I made this for a group that included vegans, vegetarians, gluten-free and carnivores. Big hit!! !